Buffalo meat used in out treats contains 14% more protein and 89% less fat than beef. Comparatively it is also lower in cholesterol and calories which mean out treats are leaner and healthier for your four legged family member. Buffalo meat vs beef, USDA National Nutrient Database. Our 100% free-range buffalo is rich in flavor! No use of grains, added hormones or antibiotics! Honey has been used worldwide as a natural source of energy, vitamins and minerals for years. Honey can potentially help dogs with allergies and digestive problems. Your best friend loved these delicious Lung Steaks...? Yes! 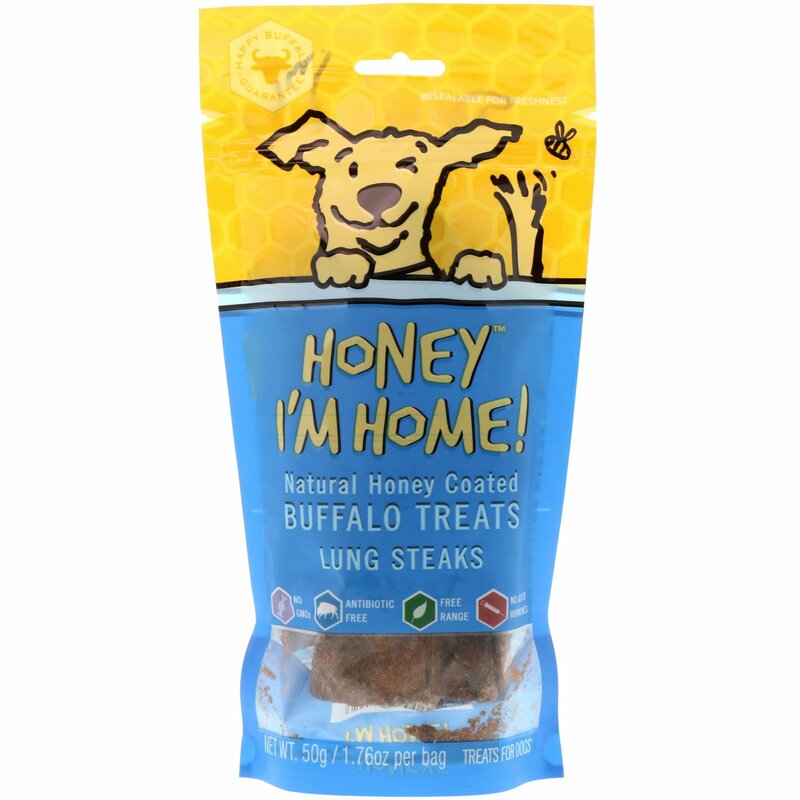 Discover more, try out other all-natural, free range buffalo, honey glazed mouthwatering treats: Buffalo Jerky, Crunchy Ears, Bully Sticks and Horn Chew. Your dog will thank you as only your best friend can. Calories Content (calculated) ME = 2988kcal/kg, 23.90 kcal per piece. Feed Guide: Ensure treat size is slightly larger than your dog's mouth. Feed as a treat or reward and not as a mean replacement. Always provide dog with fresh, clean water. 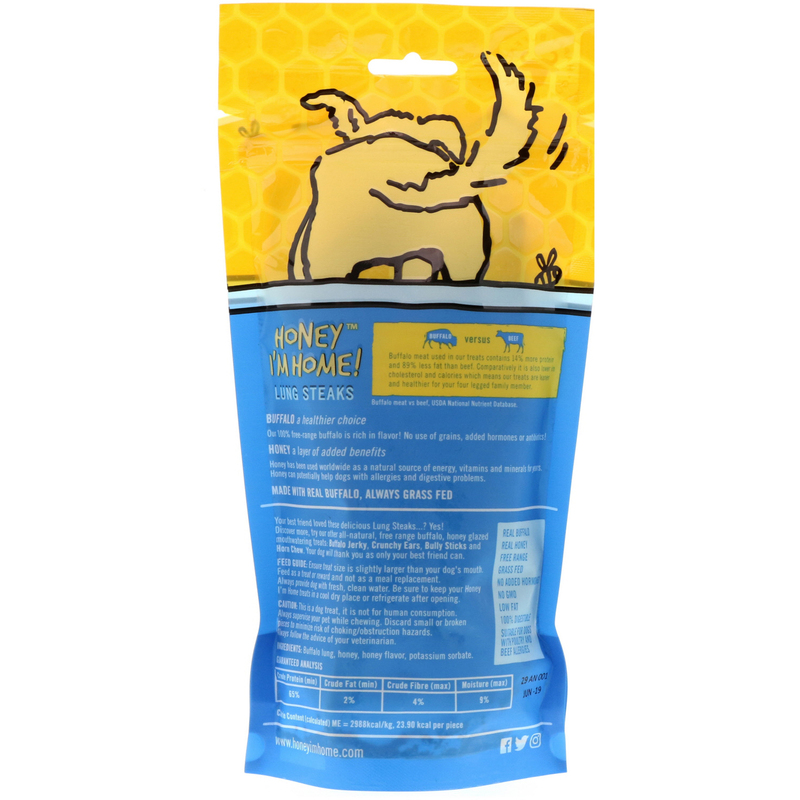 Be sure to keep your Honey I'm Home treats in a cool dry place or refrigerate after opening. Buffalo lung, honey, honey flavor, potassium sorbate. Caution: This is a dog treat, it is not for human consumption. Always supervise your pet while chewing. Discard small or broken pieces to minimize risk of choking/obstruction hazards.